To Jerusalem for the film’s premiere in Israel and my wife Dana’s 50th birthday party, with close family in attendance. A heady mixture in the Holy City! 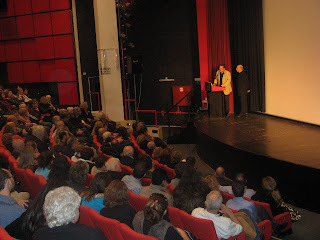 It turns out to be one of the best and rewarding weeks I can ever remember, including a couple of days off at the Dead Sea and a standing room only showing of the film at the Tel-Aviv Cinematheque attended by 450 people. What matters most to me is that my uncle Menachem is with us, 81 and still playing tennis, 60 years after being gravely wounded defending a besieged enclave in Jerusalem. 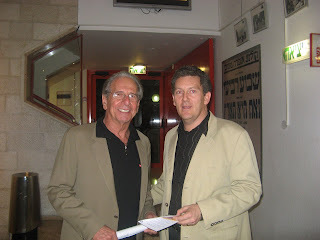 Actors Topol and Yehuda Efroni help celebrate the film at the Tel Aviv Cinematheque with great pzazz, as they both knew Garri. Topol lights the candles for the hannukah festival on stage and sings in his famous voice, then making a speech before the film. My cousin Chasia also gives invaluable support in assuring this amazing turnout and catering. What makes touring with this film so special is the following event: an elderly but sprightly man comes out of the crowd. 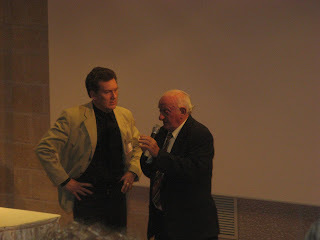 Zvi Halpern, an artist and veteran kibbutznik, explains that as a boy he escaped on the last day of the liquidation of the ghetto in the town that he and my father came from. Joining the partisans, he survived the war, and just like my uncle Menachem from the same town, got to Palestine and joined the Palmach (Jewish special forces).